This question comes up frequently, and there are several reasons why we teach other people what we know about tree house construction. First your perspective, then ours. We care about building in a tree friendly, safe, and high quality manner – it is our passion and life’s work. With all new builds, we assure the health and security of the host tree as well as making sure our materials and construction practices produce a long lasting product. Our tree building workshops follow this philosophy. We know that treehouse building will always be primarily a do-it-yourself activity, but there are very few places where people can go to learn proper tree house construction methods from expert tree house builders. A lot of the free advice out there on the internet and in some treehouse books, while well meaning, is very harmful to trees. Our goal is to teach construction methods that are safer, longer lasting, and better for your trees. You can’t get a degree in tree house building, nor can you read any one book and know it all. Building a quality tree house requires cross training in many fields such as tree biology, engineering, welding, tree climbing & rigging, carpentry, and construction in general. Our special expertise is in how these fields integrate and inform proper tree house building practices. So if you want to learn how to build a tree house the right way, or think you might like to be a professional tree house builder some day, then a tree house building workshop will give you the confidence to get started. We can also point you to appropriate sources to continue your education. We take time at each workshop to offer consulting on your individual tree house projects. If you have a napkin sketch plan or set of trees in mind, then bring your pictures and measurements to the workshop, and we will help you with planning and design. “Good treehousing” is a phrase that professional tree house builders use to explain that the goal is quality tree houses and enjoyment of them. To achieve that, we want to help you to design and build safely - both for the trees and the users. Our part in good treehousing is to educate people to build better tree houses which in turn prevent suffering in trees and keep people from making common and potentially dangerous mistakes. If you are ready to take your interest or curiosity about tree houses to the next level, then please join us at our next workshop event! 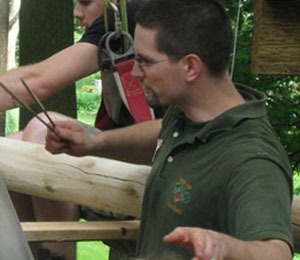 Each tree house building workshop is designed to teach you how to build a tree house from start to finish. We cover all relevant topics from tree selection, tree house design, specifics of how to build tree houses with tips & tricks we have learned along the way, and ongoing maintenance issues. Each workshop will also include some type of hands-on application project to give people firsthand experience with tree climbing and building tree-attached structures. We want you to leave our workshop with more than just book knowledge about building tree houses, so bring a tool belt and/or climbing harness if you have one and would like to get involved (just watching is okay too! ).